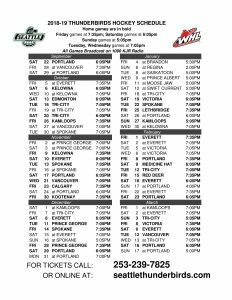 Earlier today, the 2018-19 WHL schedule was released. For the first time in 45 years, the league will play a 68-game regular season schedule. This change brings the WHL in line with the Ontario Hockey League and Quebec Major Junior Hockey League who already play such a schedule. But while that’s the big change league-wide, let’s see what the schedule holds for the TBirds specifically. If this looks familiar, it should. It’s the exact same schedule that Seattle played last season at the tournament. The one difference being that Seattle will be the home team this season vs Spokane after being the visitors last year. After not playing them at all in the preseason since 2004, this will be the second straight year that Vancouver and Seattle meet. Again, this should seem familiar as these are the matchups from last year in Kennewick. The difference this time around is that Spokane will be the home team this time after being the away squad last year. Seattle wraps up the preseason with a home-and-home against the Silvertips. Not your typical one, though, as the TBirds will host Everett on Tuesday, September 11th at the accesso ShoWare Center before heading to Everett for the return match on Saturday, September 15th. In case you were wondering, 2013 was the last time Portland and Seattle met in the preseason. Let’s start with the big change. Earlier in the offseason, the team sent out a survey asking for opinions on start times for Friday and Saturday games. While we don’t know the results of the survey, the team did decide to go with one of the options presented. All Saturday games now start a 605pm, a shift of one hour earlier from previous schedules. Friday games continue to be at 735pm. Other days that were not covered by the survey stayed the same: Sunday 505pm and weekdays 705pm. The home opener vs Portland will be the earliest that the TBirds have hosted the Winterhawks since the 2013 season/home opener that was played on September 21st. This will be just the 10th time that the two teams have met in Seattle/Kent in the month of September. 5 straight occurred in the first 5 full seasons at the ShoWare Center (2009-2013). Portland will come to Kent 5 more times after the home opener. More on that later. Seattle and Everett play their first of 10 matchups (also more on that later) on Friday, October 5th in Everett. The Silvertips come to ShoWare for the first time on Saturday, November 10th. This is fairly typical as the TBirds have hosted the Silvertips just 4 times at ShoWare in the months of September/October. These home games tend to be backloaded. Since Edmonton returned to the WHL in 2007, the Oil Kings have always visited Seattle/Kent mid-week. This year will be the first time they come to town on a weekend as they will be at the ShoWare Center on Saturday, October 13th. Seattle and Tri-City meet for the first time in the regular season on Tuesday, October 16th at ShoWare Center. This is the start of three straight games between the teams. The rare home-and-home-and-home continues in Kennewick on October 19th before coming back to Kent on October 20th. The Thunderbirds will have home games on the night before U.S. Thanksgiving (vs Vancouver) and on Black Friday (vs Calgary) this season. This is the first occurrence of this type of scheduling since 2011 and just the 4th time overall for Seattle. It will be the 6th straight season with a Black Friday home game and 10th time out of the last 11 seasons. 2019 is going to start off with a bang for the team as they embark on a 6-game swing through the Eastern Division. The TBirds will end 2018 with their mostly-annual New Years Eve game in Portland. After that, they’ll head to Brandon for a game on Friday, January 4th and then work their way back home with stops in Regina (1/6), Saskatoon (1/8), Prince Albert (1/9), and Moose Jaw (1/11) before finishing up with a tilt in Swift Current on Saturday, January 12th. This will be a matchup of the last 2 WHL Champions. Before Seattle has a home game on Saturday, January 19th vs Victoria, they head to Kennewick for a game vs Tri-City. These 8 straight away games is the longest such stretch for the Thunderbirds all season. The pattern since the Chilliwack Bruins moved to Victoria to become the Royals has been that in odd seasons the teams play in Victoria on a weekend and in even seasons they play mid-week. This being the 2018 schedule, you would expect a Tuesday-Wednesday set and that is indeed the case. Seattle heads to Everett on Saturday, February 2nd and the continues on to Vancouver Island for games vs the Royals on the 5th and 6th. 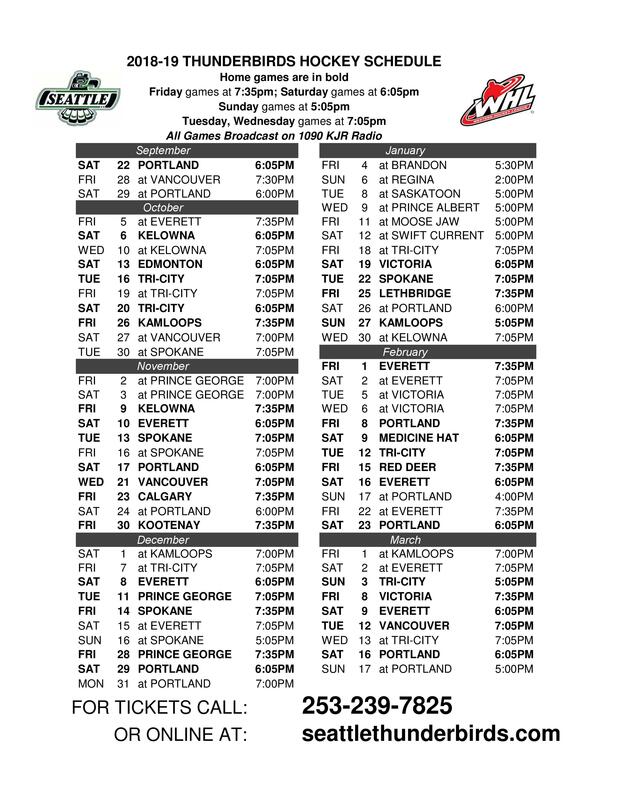 The TBirds return home Friday, February 8th vs Portland and this begins the longest homestand of the season at 5 games. They will play Portland, Medicine Hat (2/9), Tri-City (2/12), Red Deer (2/15), and wrap up with Everett (2/16). Assuming they make a return this season, just 6 2-for-Tuesday games. The opponents, in order: Tri-City (10/16), Spokane (11/13), Prince George (12/11), Spokane (1/22), Tri-City (2/12), and Vancouver (3/12). Spokane reappears on the Tuesday schedule after being absent last season. Previous to that, the Chiefs had appeared in Seattle/Kent on a Tuesday in every season since the 2008-09 campaign. This is the first season since 2007-08, when the TBirds played only one Tuesday game, that they have not had an Eastern Conference opponent on a Tuesday. Seattle wraps up the 68-game regular season on St Patricks Day in Portland. Let’s talk about the schedule matrix. I think we all assumed that with the change to a 68-game regular season schedule there might be a reduction of the number of Seattle vs Portland games, of which there is usually 12 per season. That number stays the same as does the number of Seattle-Everett matchups at 10. So where did those 4 games go? Tri-City got a reduction of 10 games to 8 and Spokane went from 8 games to 6 to get Seattle to a 68-game schedule. While the number of 3-in-3 weekends is almost cut in half, it is actually an increase over the number of occurrences in both the 2015-16 and 2016-17 seasons. The HAH weeked isn’t too bad as the away game is in Portland. The AAH weekend is a little tough as it goes Kamloops, Everett, Kent but it could have been worse. Everett is at least on the way back from Kamloops. With the reduction of 3-in-3 weekends, not surprised to see the number of Sunday games reduced. The decrease in Tuesday games seems to have come out of the home game schedule of Seattle. There had to be two home games eliminated in the new 68-game schedule and 2 Tuesday games were apparently what were cut.